Having a young family is expensive and keeping them entertained on weekends or school holidays can be very costly. Luckily we have lots of free places to go with children in our area. 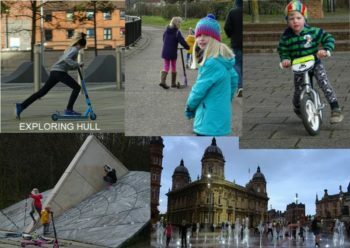 Here’s a Mumbler Guide with our top 10 things to do and places to go in and around Hull for FREE (or at least for only the cost of petrol/a bus fair or an ice-cream!). There are LOADS of parks in Hull, most of are clean and tidy and have lots of play equipment for your kids. You can find a full list of parks on Mumbler here. Pickering Park is our favourite, just off Pickering Road in West Hull. It has a good range of equipment suitable for babies, toddlers and older kids, there’s even a wooden assault course and zip line. 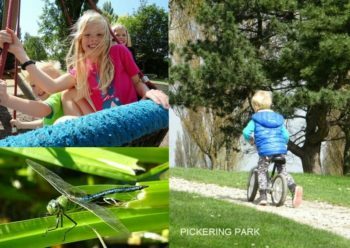 Often in the parks there is more to see and do than just the play equipment, which is certainly the case for Pickering Park. 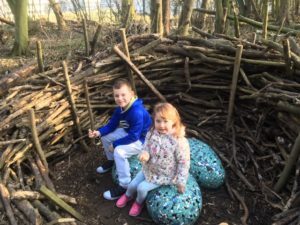 There is lots of green space to explore including a rockery and pond, a sensory garden with lots of nooks and crannies, perfect for playing hide and seek. My kids love clambering on the rocks around the pond and ducking in between the trees, you might also meet a squirrel or two. The field is large so ideal to bring a ball. There are plenty of footpaths around the park, ideal for bikes or scooters. The path around the large fishing lake is perfect and you could spot some wildlife along the way – we often see huge dragonflies, fish, swans, ducks (of course) and I’ve heard they have a terrapin population in the lake as well as a Kingfisher. The large paddling pool opens for the summer during the 6 weeks school holiday, this is kept clean and monitored by the park rangers. Plus there are clean toilets on site, open and monitored during daylight hours. Another park I would recommend is Peter Pan Park, also on Pickering Road between Costello Stadium and Warners Gym. It’s a relatively small park but recently refurbished last year with good quality play equipment. There is also a pond, perfect for feeding the ducks, as well as large green spaces for running around, playing football and generally exploring. My youngest brings his remote control car here because of the wide open spaces. West Park, near the KCOM stadium in Hull, is also quite recently refurbished with some good equipment, there’s lots to do for little ones and older ones too. 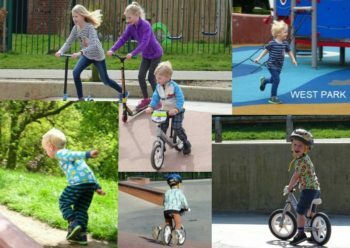 There is a skate park on the corner of Walton street close to West Park; I spent a lot of time here with my son before he started school – it’s great for balance bikes, and is usually empty during the day in term time. There is also a miniature railway nearby and a small animal enclosure. East Park on Holderness Road Hull of course needs a mention as there is lots to do and often special events for families. There are some great parks in the East Riding too. Swanland park is always a hit with my children, as is North Cave park. The North Cave park has a lovey stream across the road to paddle in if its warm enough and a safe off road cycle path leading up to Hotham so we often make a day of it and do the park, a picnic and a bike ride to Hotham. The Marina is a good place to start; we often bring the kids down here and let them burn off some energy, there’s plenty of open space for them to run around and play in (near Minerva). Have a look for boats on the Humber river too, we saw a huge dredger here the other day dredging mud from the bottom of the estuary which the kids loved watching. You can then admire the boats moored in the marina and if you’re lucky watch the lock gates open and close. You can walk all the way to The Deep from here and see the tidal barrier, passing along the newly regenerated Fruit Market at Humber Street where there is often family activities and events running. 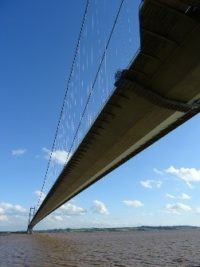 Alternatively you can park at Victoria Dock and walk towards The Deep from the other direction, it’s a lovely, safe walk along the Humber Estuary with a great view of the Humber Bridge and plenty of history. I think my kids spent an hour jumping off some steps around there somewhere recently. Head off the path just near the Half Tide Basin and you’ll find a giant sundial and a park. From the marina it’s a short hop across to the City Centre. For free you can splash in the Queen Victoria Square fountains, picnic in Queens Gardens, explore Hull Minster, or….. Pick up a free trail map from tourist information in Paragon station and away you go; with around 40 fishes to spot, it’s great to get the kids involved, and you’ll probably discover some parts of Hull you didn’t know existed. Hull and the East Riding has plenty of history and plenty of museums, all are free entry. Choose from Streetlife Museum, The Arctic Corsair, Wilberforce House and The Hull and East Riding Museum all within the museums quarter, or the Maritime Museum in Queen Victoria Square. You can also pop in to Feren’s Art Gallery also located in Queen Victoria Square which has a children’s room. Both Streetlife and Feren’s also have weekly playgroups and under 5’s sessions. In Beverley you can find Treasure House and the Beverley Guildhall, both of which have things for children to do and toys to play with. Further afield are Hedon Museum and the Yorkshire Waterways Museum in Goole is excellent. Sometimes the museums have extra free events on for families, usually craft sessions or trails (you’ll find these on the Mumbler School Holidays page or Events Calendar). The Hull History Centre on Worship Street (near Hull New Theatre) is also worth a visit. They have History Makers, a free family activity once a month and there’s often a historical exhibition in the main foyer. Find information about all of these museums on the Mumbler Days Out, Museums page here. Take a walk, scoot or bike ride over our iconic landmark. In 2017 the Humber Bridge was given Grade 1 listed status by Historic England, making it the longest listed structure in the UK. Fun fact – there’s enough wire used on the bridge to go around the moon 6 times! The pavements across the bridge are free to use, flat and safe, even if you don’t make it all the way across the views from it are fantastic. If you get all the way across to the other side there are 2 good nature reserves to visit on the south bank. 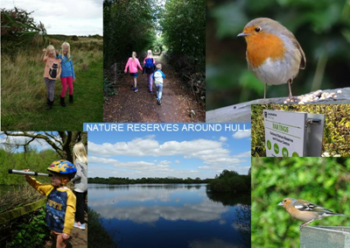 Hull has it’s own nature reserve, located on Noddle Hill Way in Bransholme. We took a trip down there last year, there are paths around the reserve and lots of wildlife to see. Just across the Humber Bridge on the south bank are 2 great nature reserves, Water’s Edge and Far Ings, there’s also Whisby Park which is about an hour’s drive over the bridge. 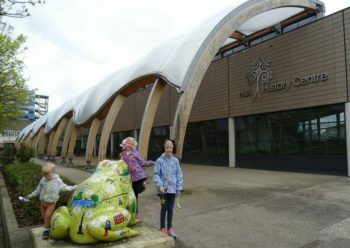 All 3 of these are free entry and have visitor centres, walking trails to explore and bird hides dotted around. Water’s Edge and Whisby Park also have play areas and a café. We are still on what feels like a never ending quest to see a Kingfisher and have it on good authority that there is one at Far Ings, but we have yet to see it. The paths along the banks of the south bank adjacent to the Waters Edge and Far Ings are well looked after and perfect for bike rides too. There is also a short nature trail and walk at Bridgehead Business Park, Hessle. Park in the car park and start it from the side that backs onto the East Riding Household Waste site (the tip), you can then walk through a short wooded section looking out for unusual things such as junk models and even a next full of dinosaur eggs! We often bring the kids down here for some fresh air, to collect stones, walk or bike along the river. There’s a nice walk along the path called Jean’s Walk – you can park for free in a carpark off Livingston Road near the small skatepark, then you can follow Jean’s Walk all the way along to the main part of the Foreshore. It’s a very picturesque part of Hull, especially on a sunny day. 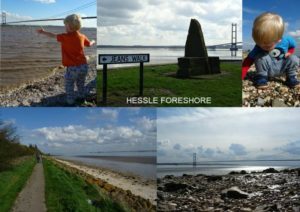 Near to Hessle Foreshore, located within the Humber Bridge Country Park is Little Switzerland, a 48 acre wood with open meadows and wildlife ponds. There are lots of pathways winding through the woods with 3 different trail to choose from, The Meadow Trail (1.25km), The Pond Trail (2.5km), and The Cliff Trail (3km). Along these trails you will find all sorts of wildlife including many species of butterfly and birds and some amphibians in the ponds, we have seen a few newts. 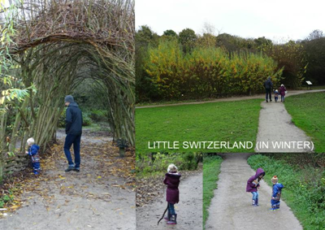 To access Little Swiss park at Hessle Foreshore and walk along the paths from there (all flat and ideal for prams), or park in the Humber Bridge Car park and enter from the top (there are several steps down into the woods from this way). They also do a park run from here every Saturday (as well as at Peter Pan Park and East Park). Nutwood at Raywell, a small woodland area located opposite Raywell Hall. It’s good for a short walk and exploring the woods with the kids, and great to see bluebells in. Millington Woods near Pocklington also provides a good free day out and is picturesque in all seasons. It is now a local nature reserve and has a couple of different walking routes, suitable for all abilities. Beverley Westwood is a large open area opposite Beverly racecourse, great for walking on a sunny day and sledging in Winter! There is a small area of woodland at the top which great for exploring and spotting wildlife, you might even meet some cattle. Libraries are a great opportunity for a quiet morning or afternoon spent with your children. Most libraries have a children’s area, joining is free and you can borrow books for up to 3 weeks at a time. A lot of libraries also offer free sessions for under 5s, such as story time, craft sessions and baby bounce – you can find a list of all the local libraries here. For older kids there’s the Summer Reading Challenge (and often mini ones at other school holidays) which run through the Summer Holidays and encourages children to love reading. East Park has a library now, next to the cafe, so you can combine a free day out at the park with one of their free weekly sessions! Cleethorpes – Lincolnshire, with over 4 miles of golden sand this is the perfect place for a day out with the family. Build sandcastles, play games, or have a paddle in the sea. With plenty of attractions, cafes and arcades, there’s plenty to do. Spurn Point – Now classed as a tidal island and only accessible on foot (please check tide times) due to a storm in 2013 which washed part of the access road away. It’s a beautiful walk with plenty of birds to spot, a lighthouse to visit, and lots of World War 2 history to investigate including underground bunkers. It’s very mysterious being able to stand on the sand and have the rough North Sea on one side and the opening of the Humber Estuary on the other. Withernsea & Hornsea – Lovely pebbly beaches perfect for stone skimming, and also good fish and chips. Hornsea is a particularly nice place to go if you like huge waves – they are quite impressive! 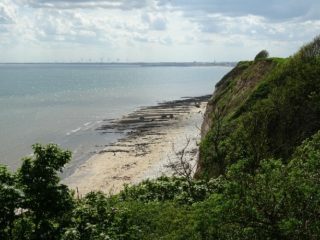 Fraisthorpe – A quiet more sheltered beach ideal for children just south of Bridlington. Parking is cheap in the farmers field above but getting down to the beach with a lot of children’s things can be tricky. The beach is used by windsurfers and kite surfers giving children plenty to watch and the sand is also great for sandcastles. There is also The Cow Shed near the car park which is a lovely cafe serving food and drinks and there is also a good, clean toilet block. Danes Dyke – Near Bridlington. Access to the beach is by a steep surfaced road, manageable with pushchairs or through a lovely woodland trail. If the tide is out the beach is very flat and sandy, with a pebble and rock area closer to the cliffs and plenty of opportunities for exploring and discovering sea life in the rock pools. There is also cafe and toilet block in the car park. Bridlington – a great day out, whether you go for the typical tourist day out with amusements and rides you just want a quiet day at the beach, then Bridlington has both. Parking at South Shore park & ride is recommended, you can access the quieter part of South Shore beach via good steps where the sand stretches for miles, or you can get the bus or walk to Bridlington’s main South beach. The area has recently been renovated with nice toilets, cafes and a small splash stream running along the promenade. The land train also runs into town from here. From the old harbour you can watch the fishermen, take your own crabbing and fishing equipment and fish from the harbour wall or take a boat ride. Amusements and arcades are located north of the harbour. The Bridlington Spa Theatre also has some good children’s shows throughout the year. 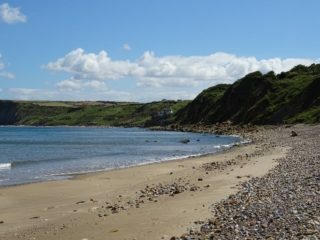 Cayton Bay – a picturesque beach just before you arrive at Scarborough on the coastal road. It’s quite a steep walk down to the beach (just about manageable with buggies) but it’s worth it when you get there to see the vast sweeping bay. This place is perfect for beach games, sunbathing, fossil hunting, paddling, surfing. There are also great facilities including a small shop, cafe and toilets. The last time we went there it felt like we were in a foreign country, we turned left as we got onto the beach and walked for about half mile and found our own little secluded spot. Scarborough – a popular seaside destination and can be reached in just over an hour’s drive (or direct train from Hull or Beverley). There is loads to do for children from donkey rides on the beach to walking up to the old castle. Driving from Beverley takes you on a very scenic drive past Driffield and over the wolds ending in the dramatic drop down Staxton Hill. 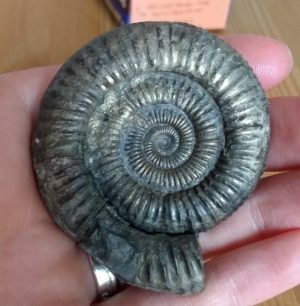 The beaches along the East & North Yorkshire coastline are also rich in fossils, so if you’re after finding a perfect ammonite, belemnite or brachiopod then the best places to go are Cayton Bay, Speeton (near Hunmanby), Runswick Bay, and a bit further along the coast – Boggle Hole and Port Mulgrave. We have found some excellent specimens on our treasure hunts along these beaches. We hope these ideas have inspired you to have some free days out with your family! For more ideas, Mumbler has a section dedicated to listing free days out, find it here. If there is anything missing that you love to do and is free for the family please send them in to me here and we’ll add them to the list. Happy exploring!